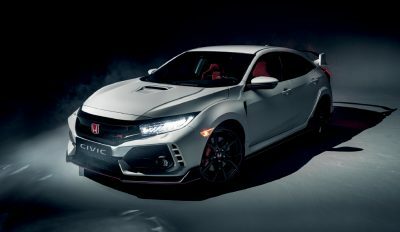 Another special Honda vehicle, the new Honda Civic Type R, is set to lighten more than just the driving enthusiast’s travel to work. Ralph Waldo Emerson once said, “The one thing in the world of value is the active soul.” There are many ways we can nourish the soul but, for the person who enjoys the ultimate driving experience, one of the ways to quickly get rid of the heavy feelings is through a quick drive in a hot-hatch like the latest Civic Type R.
Now, for a little bit of history: in 1995, Honda introduced their first Integra Type R. This model was equipped with a 1.8-liter DOHC VTEC in-line 4-cylinder engine with a really healthy 147 kW. There were numerous differences between this Type R engine and the standard DOHC VTEC engine that was presented in other Integra models, but it was the increased power that set the early Type R apart. The fundamental mechanics that gave this engine so much more power was mainly due to the higher compression, larger throttle body, high lift camshafts and high-volume exhaust manifold. Today, the new Honda Type R packs an incredible 235 kW of power and 400 Nm of torque via the high performance, turbocharged 2.0-litre four-cylinder engine. Setting a new standard for FWD, the new Honda Civic Type R offers phenomenal performance that is loads more than rival models like the Volkswagen Golf R and Renault Megane RS 275. The 2017 Honda Civic Type R car features a stiffer chassis for even better road holding, a new rev-match system for its six-speed manual transmission that equates to superior engine power delivery and a new multi-mode suspension with comfort, sport and track driving modes. Looking absolutely smashing, the Honda Civic Type R is mean and intimidating with plenty of mystical style and design. Being a front wheel drive, the car is cleverly matched to one of the best traction control systems available to FWD cars. Colossal power and speed is what this front-wheel-drive performance hatch is all about. Honda has revised the aerodynamics in the new Type R, including features like supercar-spec flat underbody elements and oversized spoilers. These features deliver loads of downforce at higher speeds. 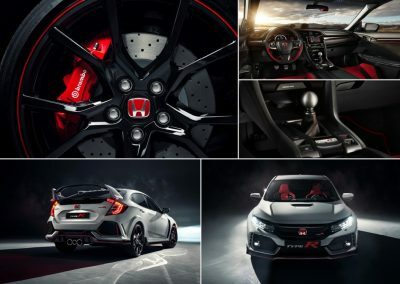 Along with the latest Honda NSX model, now on sale, Honda’s introduction of the new Type R gives the brand a real new lease of life, marketing power and excitement – the sort of lift the Honda brand needed to deliver on. What Honda has also recently managed to do with the latest Civic Type R is head to the famous Nürburgring in Germany and set the new benchmark lap time. The 2017 Honda Civic Type R has claimed the title of world’s fastest production front-wheel-drive (FWD) production car, and on April 3, 2017, a Civic Type R lapped the 20.76-kilometre Nordschleife (north loop) in a record 7 minutes 43.80 seconds. The time is 3 seconds faster than the previous FWD record. With all this performance, the Honda Civic Type R will also be able to return a combined fuel consumption figure under 9 litres/100 km. Run through a slick 6-speed manual transmission, the rev match control system asks exactly what the driver demands making the drive an intimate, connected experience. 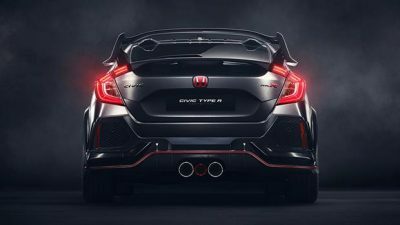 The stiffer chassis and revised suspension gives impeccable cornering ability, while the lighter and more rigid body shell keeps the Civic Type R tracking in a nice level fashion through the corners. The front MacPherson strut suspension of the new Civic Hatch is revised with new geometry to minimise torque steer and maximise sports handling. At the rear of the car, the new independent multi-link system is upgraded with the use of unique high rigidity suspension arms. Some other areas the 2017 Honda Civic Type R has taken some leaps forward are in the latest advanced safety and driver assistive sensing technology. The clever technology works to avoid accidents from happening. The Type R sees the addition of Honda’s Collision Mitigation Braking (CMBS) with Forward Collision Warning (FCW), Lane Departure Warning (LDW), Lane Keep Assist (LKAS), Road Departure Mitigation (RDM) and Adaptive Cruise Control (ACC), LaneWatch Camera and Auto High-Beam (AHB) all being standard features on this super-hot hatchback. 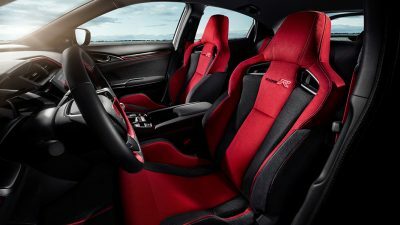 Even with performance being the major focus for the new Civic Type R, the car packs plenty of the best technology and luxury inside the sporty interior. Adaptive cruise control, an LCD driver information interface with colour display, dual-zone climate control, an accessory 12V power outlet in the front, power windows, an auto dimming rear-view mirror, smart keyless entry with a push start button, Type R front sports bucket seats with red suede style fabric, rear seats with Black fabric and red stitching, Android Auto with Google Voice search, Apple CarPlay with Siri Eyes Free mode, Bluetooth connectivity with audio streaming and a 160 W sound system (4 speakers and 4 tweeters) mods up the Type R masterfully. You can choose your new Honda Civic Type R in four exterior colours including Rallye Red, Crystal Black, Polished Metal and the heritage Type R colour – Championship White. A five year/unlimited km warranty comes with the car. So, here you have yourself the next hot-hatch benchmark. The 2017 Civic Type R is a real sensation and a credit to the clever Honda design team. For any more information on the 2017 Honda Civic Type R or, for that matter, any other new car, contact one of our friendly consultants on 1300 303 181. If you’d like some fleet discount pricing (yes even for private buyers! ), we can submit vehicle quote requests out to our national network of Honda dealers and come back with pricing within 24 hours. Private Fleet – car buying made easy!